Ah, the Bahamas – perhaps the most popular spot in all of the Caribbean, or at least the busiest. Many travelers have been to the Bahamas, but only to briefly explore Nassau, the port of call for many cruises and typically where visitors will fly into during their trip. Did you know that the Bahamas is actually an archipelago make up of nearly two thousand islands? Most of those are uninhabited and not really accessible unless you plan on taking your own fishing trawler out for a spin. Most of the focus is on three islands, which brings in the majority of visitors. Here’s an overview. I’ve heard the Grand Bamaha called the “green island” – not because if its colour, per se, but because this is the base where travellers can meet up with a number of different eco-tour operators. This is the northernmost island, and the fourth largest. If you’re not interested in the ecological tours, you might check out some of the islands old town settlements – plenty of history and culture to see here. West End was the hot spot during the bootlegging days, and there you’ll find several old churches and other sights where history took plac, considering the Siboney Indians called this island home over 7,000 years ago. Other sightseeing suggestions: the botanical gardens, the Gold Rock Beach (check it out at low tide), and the spiritual Grand Bahama Labyrinth. Many travellers prefer the grand Bahama because it offers a much more relaxed, peaceful experience, with many opportunities to explore spots on the island that just are not as busy as New Providence Island. Freeport is the only “large” city on the island. At times, New Providence Island doesn’t much resemble the Caribbean – this island is dominated to the east by the sprawling capital city of Nassau, and then to the west there’s the airport. It isn’t a huge island by any stretch of the imagination, so at times it can feel a bit cramped, especially if the port is full – incredibly, up to 7 of those massive cruise ships can park here at one time. Nassau is an interesting place to explore – it was founded as a colonial city in the British Commonwealth, and you’ll note that influence on architecture and the overall vibe in a way – such as the Pink Parliament house, which seems to be the perfect mix of the two cultures. Nassau was also for a time a pirate’s den, so some tourist locations play of this little bit if history, such as the Pirates Museum, which can be a fun for the wee ones. 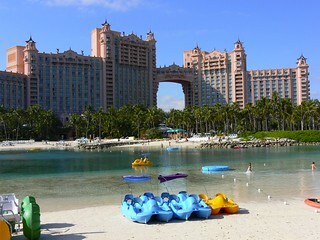 Outside of Nassau, Cable Beach is another popular spot which is an easy bus ride and has plenty of hotels and a casino. It’s also pretty reasonably priced, and the water is so clear it’s like a bathtub. Paradise Island may sound like some remote dreamy place, but it’s actually a small island just north of Nassau – you can take a bridge there, or a quick ferry ride. It’s mostly the dominion of the Atlantis Casino, a casino that is huge in the Las Vegas sense of the word. What’s unique about the Atlantis atmosphere is that it is very relaxed – you can hop out of the pool, hopefully towel off, and then head into the casino for a fresh beverage and a round of craps. Yes, in your bikini (or speedo, I suppose). Other interesting stops include a place called The Dig – massive underground rooms with glass walls that let you check out some of the artefacts found that have led many to believe that this spot was where the Lost City of Atlantis was. As much as I’d like to say it is all a show, you’ll have to check out the exhibit and decide for yourself. Don’t spend all your time at the Casino – there are some lovely spots and scenic viewpoints around the island, such as the Versailles gardens, a great place to get some fresh air and stretch your legs. When we went to Paradise Island we were shocked by the fact that you can’t pay for anything in cash, instead you have to pay by credit card. Also there’s a tip on top of EVERYTHING – including ice cream. The food was expensive. But, to be honest, we had a blast! The “rides” were fantastic – the not so lazy river, especially so. If you get there early then there are literately no queues as the Americans are still at the breakfast table. But do explore out of the Paradise Island complex by the marina for some cheaper and more relaxed beverages. We also did the swimming with dolphins too. Definitely don’t buy the DVD of the day as its hacked together with no production quality and cost about £45 for something that’s unwatchable. We hardly made it out of the All-inclusive resort, and Nassau isn’t much of a trip, but I expect there was more to do around the island.